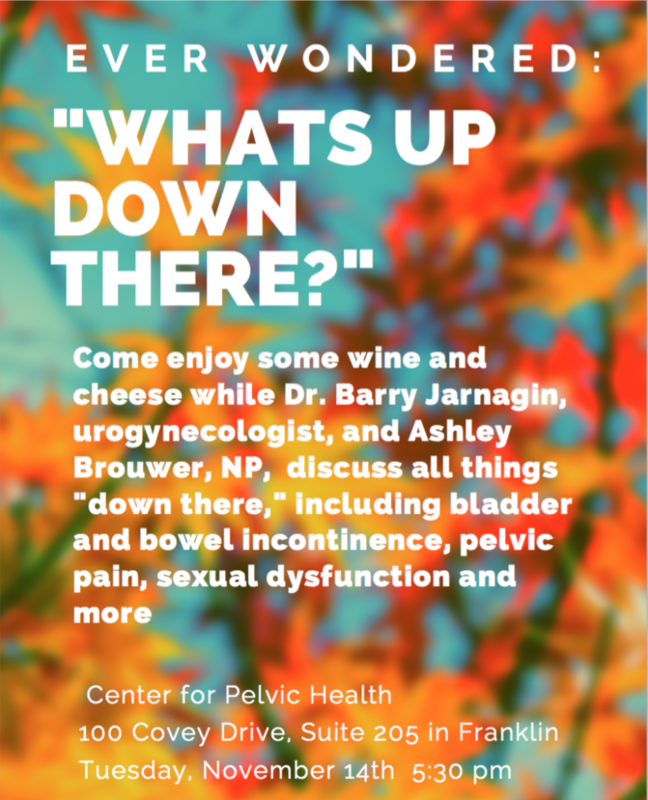 Come enjoy wine and cheese on November 14th at 5:30pm while Dr. Barry Jarnagin and Ashley Brouwer discuss all things “down there,” including urinary and bowel incontinence, pelvic pain, and sexual dysfunction. RSVP today to reserve your spot for this free event. “What’s Up Down There” will take place at the Center for Pelvic Health, located at 100 Covey Drive, Suite 205, Franklin, Tennessee. Call or use the form below to RSVP. This entry was posted in Upcoming Events on November 3, 2017 by WSDigital. This entry was posted in Upcoming Events on April 29, 2015 by admin.